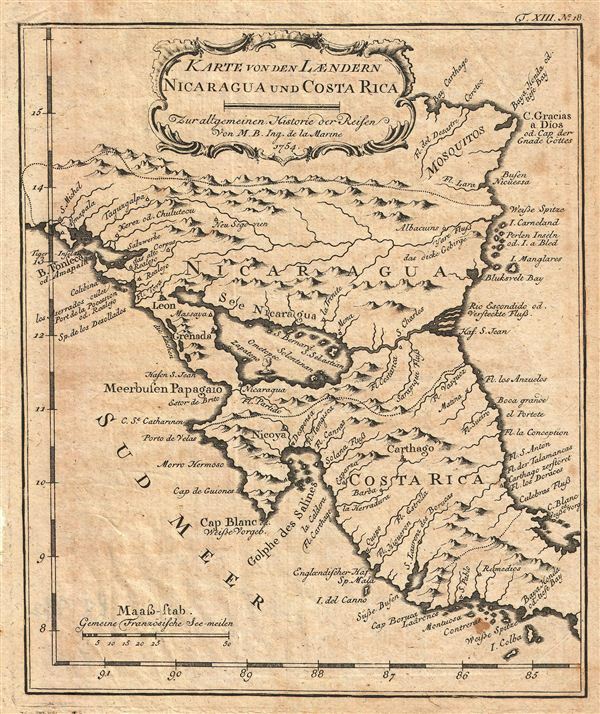 A beautiful map of Nicaragua and Costa Rica in 1753 by Jacques Nicholas Bellin. Covers From the Bay of Fonseca and the Mosquito Coast (Belize) south as far as Isla Colba in modern day Panama. In 1502 Columbus anchored a ship just off the coast of Limon and the area would become part of the Spanish Empire's 'Captaincy General of Guatemala.' The British established a protectorate on the eastern seaboard of 'The Rich Coast' in the mid-1600s, starting a rivalry with Spain that lasted for nearly 200 years. The latter half of the 1600s also saw bloody incursions by English, French and Dutch pirates. Dreamed for mineral wealth, however, did not materialize, and Spanish trade restrictions, natural disasters and foreign attack had kept the economy unstable. Furthermore, the native populations would not succumb to slavery, unlike their counterparts to the North. Nonetheless, the Spanish began to realize the area's agricultural potential, and by the early 1700s had exploited it enough to form wealthy elites. At the time this map was made a more destructive rivalry had emerged, one that would continue to ravage Central America well into the 20th Century: free trade 'liberals' vs. protectionist 'conservatives.' Bourbon-backed 'liberal' free-trade policies were popular with growers of new crops, merchants and exporters, while old-guard, Hapsburg-backed, 'conservative,' trade-monopolistic policies were backed by wealthy land owners. The often violent rivalry that emerged between liberals and conservatives has proven to be one of the most destructive aspects of the area's history. Almost seventy years after this map was made Nicaragua achieved independence from Spain in 1821 and joined the Federal Republic of Central America in 1823. Published in the 1754 German edition of Abbe Provost's Voyages. Provost, A., Allgemeine Historie der Reisen zur Wasser und zu Lande: oder Sammlung aller Reisebeschreibungen.. in Englischen zusammen getragen, und aus demselben und dem Französischen ins Deutsche übersetzt., c. 1750.